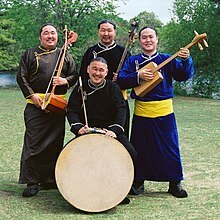 Tuvan throat singing, Khoomei, Hooliin Chor (in Mongolian, ‘throat harmony’), or Mongolian throat singing is one particular variant of overtone singing practiced by people in Mongolia, Inner Mongolia, Tuva and Siberia. In 2009, it was inscribed on the Representative List of the Intangible Cultural Heritage of Humanity of UNESCO, under the name Mongolian art of singing, Khoomei. The animistic world view of this region identifies the spirituality of objects in nature, not just in their shape or location, but in their sound as well. Thus, human mimicry of nature's sounds is seen as the root of throat singing. An example of this is the Mongolian story of the waterfall above the Buyant Göl (Deer River in Tuvan), where mysterious harmonic sounds are said to have attracted deer to bask in the waters, and where it is said harmonic sounds were first revealed to people. Indeed, the cultures in this part of Asia have developed many instruments and techniques to mimic the sounds of animals, wind, and water. While the cultures of this region share throat singing, their styles vary in breadth of development. Ordinarily, melodies are created by isolating the 6th, 7th, 8th, 9th, 10th and 12th partial in accordance with the harmonic series. Thus, if the fundamental frequency were C3, the overtones would be G5, B♭5, C6, D6, E6, G6. However, it is possible to reach as low as the 2nd and as high as the 24th. The fundamental pitch is typically around a G below middle C, and this affects the range of partials the singer can reach, with higher partials more easily reached on lower notes, and vice versa. An illustration of the harmonic series in musical notation. The numbers above the harmonic indicate the number of cents difference from equal temperament (rounded to the nearest cent). Blue notes are flat and red notes are sharp. The people of Tuva have a wide range of throat singing vocalizations, and were the pioneers of six pitch harmonics. There are several different classification schemes for Tuvan throat singing. In one, the three basic styles are khoomei, kargyraa and sygyt, while the sub-styles include borbangnadyr, chylandyk, dumchuktaar, ezengileer and kanzyp. In another, there are five basic styles: khoomei, sygyt, kargyraa, borbangnadyr and ezengileer. The substyles include chylandyk, despeng borbang, opei khoomei, buga khoomei, kanzyp, khovu kargyraazy, kozhagar kargyraazy, dag kargyraazy, Oidupaa kargyraazy, uyangylaar, damyraktaar, kishteer, serlennedyr and byrlannadyr. These schemes all use Tuvan terminology. Khorekteer refers to the "chest voice". This is the voice that throat singers use when using khoomei, kargyraa, or any other harmonic-inducing style. The term can also be used to refer to all styles of Tuvan throat singing, much like khoomei. It can also refer to the feeling of chest resonance or pressure that one experiences when throat singing. Khorekteer is often used as a launching pad into the khoomei, sygyt, or kargyraa styles of throat singing. The most popular style of Tuvan throat singing is known as Khoomei (or Khöömei, in Cyrillic: Хөөмей). Khoomei is traditionally a softer sounding style, with the fundamental (or drone) usually in the low-mid to midrange of the singer’s normal voice. In this style, usually 2 or 3 harmonics can be heard between one and two octaves above the fundamental. In Khoomei, the abdomen is fairly relaxed, and there is less tension on the larynx than in other styles. Pitch is manipulated through a combination of movements of the lips, throat, tongue or jaw. Singing in this style gives the impression of wind swirling among rocks. The term Khoomei is also used as a generic term to designate all throat singing techniques in this region. Sygyt (in Cyrillic: Сыгыт), literally 'whistling', has a midrange fundamental and is characterized by strong, flute-like or rather piercing harmonics, reminiscent of whistling. Also described[according to whom?] as an imitation of the gentle breezes of summer, the songs of birds, the ideal sound for the harmonics is called Чистый звук—Russian for clear sound. To perform Sygyt, the tongue rises and seals around the gums, just behind the teeth. A small hole is left back behind the molars, either on the left or right side. The sound is then directed between the teeth to the front of the mouth. The lips form a bell-like shape, usually with an “ee" vowel, and the sound is directed through this small opening. Pitch is manipulated exactly the same way as in khoomei style. Arthur Miles was a 1920s Texan singer of cowboy songs. He is credited with independently creating a style of throat singing, similar to sygyt, as a supplement to the normal yodeling of Country Western music. Two recordings exist that are attributed to Arthur Miles. The recordings are the first and second parts of a tune titled "Lonely Cowboy". The more deep sounding style of throat singing is known as Kargyraa (in Cyrillic: Каргыраа). Kargyraa has a deep, almost growling sound to it and is technically related to Sardinian bass singing in Canto a Tenore choirs, and also to Tibetan Buddhist chant and has some similarities with the way Popeye's cartoon voice was created. It uses both the vocal and the vestibular folds (also known as "false vocal cords") simultaneously, creating two connected sources of sound. By constricting the larynx, the vestibular folds can be brought together (adducted) and, under certain conditions, vibrate. It can produce an undertone exactly half the frequency of the fundamental produced by the vocal folds. Therefore, for each second vibration of the vocal folds, the vestibular fold completes a whole vibration cycle. While the larynx generates such rich sound, the mouth cavity may be shaped, just like in the manipulation of vowels, to select some particular harmonics, resulting in a sound that may be perceived as having different pitches simultaneously. This vocal mechanism has been recently elucidated and shown to be identical to "sardinian bassu", which is one of the four voices of sardinian "canto a tenore" choirs. It is also similar to the chant practiced in Tibet by the Gyuto monastery and other Buddhist orders. There are two types of Kargyraa: Dag (mountain) and Xovu (steppe). The Dag style is deeper, while Xovu is raspier and sung at a higher pitch with more throat tension and less chest resonance. There are also the distinctive kargyraa styles of Vladimir Oidupaa and Albert Kuvezin, the latter also bearing the name kanzat. This is sometimes described[according to whom?] as the howling winds of winter or the plaintive cries of a mother camel after losing her calf. Of the following list, two effects that commonly employed in the khomeii, sygyt and kargyraa styles: Borbangnadyr and Ezengileer. Borbangnadyr (Борбаңнадыр) is a trill reminiscent of birds and traveling brooks, made by rapid movements of the tongue. Another effect that is usually added to this style is the light quivering of the lips,called "byrlang". Ezenggileer (Эзеңгилээр) is a pulsating style, attempting to mimic the rhythms of horseback riding. It is named after the Tuvan word for stirrup, ezengi. Chylandyk (Чыландык) is simultaneous Sygyt and Kargyraa. This creates an unusual sound of low undertones mixed with the high Sygyt whistle. It has also been described as the "chirping of crickets." A careful listener can further break down this style into Dag Chylandyk and Xovu Chylandyk. Dumchuktaar (Думчуктаар) could be best described as "throat humming". The singer creates a sound similar to sygyt using only the nasal passage. The word means to sing through the nose (dumchuk). The mouth does not need to be closed, but of course it demonstrates the point better. There were a few female throat singers in Tuva's history, though it was believed a woman performing throat singing could hurt her male relatives and cause her difficulties during childbirth. Choldak-Kara Oyun, the mother of the famous throat singer Soruktu Kyrgys and grandmother of the husband of famous Tuvan actress Kara-Kys Namzatovna Munzuk, throat sang throughout her life while milking her cows, singing lullabies to her children and sometimes while she was drinking Tuvan araga (fermented milk alcohol). Close relatives of famous singers, like Khunashtaar-ool's niece (in the 1960s) and Kombu's daughter (in the 1940s or 1950s), performed khoomei (throat singing) in public more than once. The wife of the throat singing shaman Bilek-ool from Manchurek, Aldinsova Tortoyavna, said that she has always sung khoomei "because it was innate to [her] from birth." She could not resist singing khoomei after she got married and had children, and sang khoomei in public in the 1950s and 1960s. But her sister, who also sang khoomei as a girl, gave up when others repeatedly reminded her of the supposed dangers. In the Soviet era it was rare for women to perform on stage, except during Republican festivals. Valentina Salchak performed throat singing in public in 1979. Valentina Chuldum from Mongun-Taiga (1960- Autumn 2002) toured European countries as a throat singer in the early 1990s. With the start of the International Symposium of Khoomei women could sing publicly there. Tyva Kyzy (Тыва Кызы, pronounced [tɯˈva kɯˈzɯ]) (Daughters of Tuva, in Tuvan Turkish), founded in 1998, is an all-female folk ensemble performing Tuvan throat singing, under the direction of Choduraa Tumat. It is the first and only women's group in Tuva that performs all styles of Tuvan throat singing. List of overtone musicians - chapter "Tuva"
'Genghis Blues, a documentary about an American musician's trip to Tuva to compete in a throat singing contest. ^ "Mongolian art of singing, Khoomei - intangible heritage - Culture Sector - UNESCO". www.unesco.org. Retrieved 2018-02-04. ^ Aksenov, A. N. Tuvan Folk Music. Asian Music, Vol. 4, No. 2 (1973), pp. 7-18. ^ Slobin, Mark. Ethnomusicology. Volume 36, No. 3, Special Issue: Music and the Public Interest. (1992), pp 444-446. ^ Levin, Theodore (2006). When Rivers and Mountains Sing. Bloomington, IN: Indiana University Press. ISBN 0-253-34715-7. ^ Levin, Theodore C.; Edgerton, Michael E. (September 1999). "The Throat Singers of Tuva". Scientific American. ^ "International Scientific Centre "Khoomei"". Khoomei.narod.ru. Retrieved 2008-11-27. ^ "The website Khoomei.com has a great video demonstrating khomeii style". ^ Alden-ool Sevek (1995). "Dag (Muntain)Kargyraa". (MOV video). khoomei.com. ^ Kaigal-ool. "Orphan's Lament". (MOV video). khoomei.com. "Kaigal-ool sings his heart out in several khoomei styles." ^ "An excellent example of Borbangnadyr". Fuks L., Hammarberg B. and Sundberg J. "A self-sustained vocal-ventricular phonation mode: acoustical, aerodynamic and glottographic evidences", KTH TMH-QPSR 3/1998, 49-59, Stockholm. Michael Emory—tutorial on beginning throat singing.